RoadTour Serbia kicked off with Nenad and Dragan picking us up at Belgrade airport. The first audition took place in Nenad's studio where the maiden pair of Xenias in gorgeous Indian Palisander was leashed to a stack of Solaja Audio electronics fronted by a laptop music server with a baby Xenia screensaver. Having never heard a Raal-enabled speaker before -- even though ribbon speakers have made minor appearances on my review menu -- I was very surprised by just how broad their off-axis response was. Image localization is a function of high frequencies. If those beam, i.e. are focused in one narrow area coincident with the so-called sweet spot, the center image will collapse into one speaker as soon as you move out of the middle. Not here. 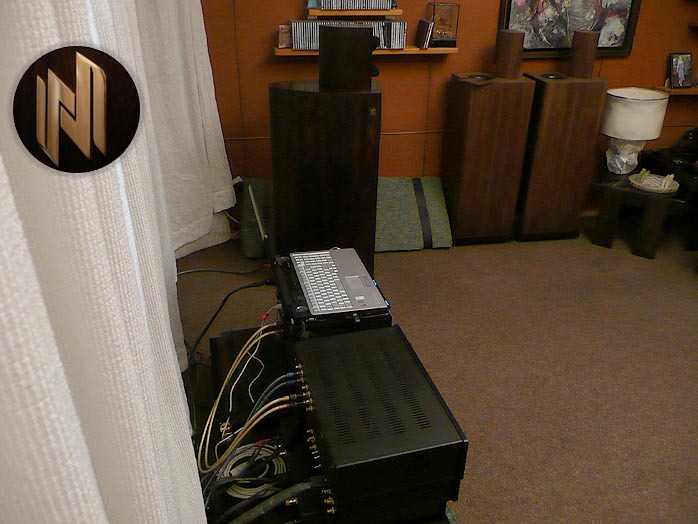 I could stand in the room's right or left rear corner and still enjoy a wide soundstage between both speakers. Xenia is a social family, not lone-wolf design. Surprise two was the complete absence of metallized energies in the upper frequencies which I usually hear with ribbon tweeters. These were airy and substantial, sweet and resolved all at once. I did need to ask Nenad for a higher seat than his comfy low-boy to get inside the broad left-to-the-right window of the ribbons' deliberately restricted vertical dispersion. Once ear and tweeter pod heights were in sync, everything snapped into focus and expanded into the third dimension. Even though Ejvind Skaaning of Audio Technology founded Dynaudio and ScanSpeak, his and Per's present range of transducers (they don't make tweeters) performs on a different plateau than ScanSpeak's Revelators. Nenad concurred. Even though the latter measure perfectly in every aspect, they lack the 'spark of life' you get from today's Audio Technology units. Admittedly, those are expensive. 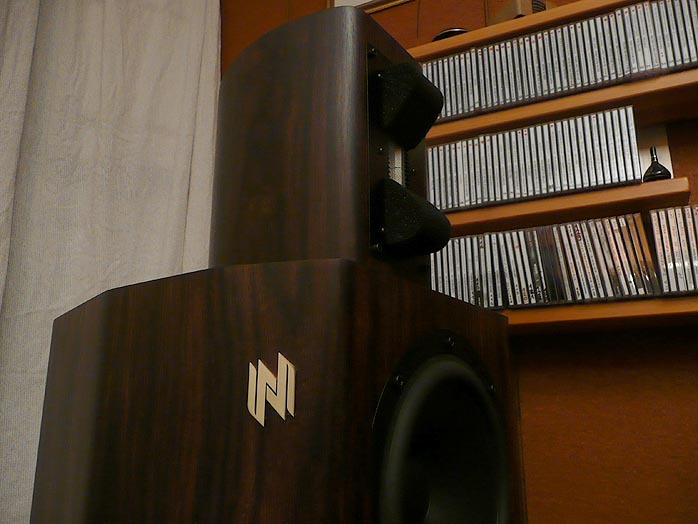 But especially for a very small speaker design house, their price also carries a priceless assurance. "If I order 4 woofers today and another 8 in 3 months and another 20 a year later, they all will be absolutely identical in every respect. Go to China and your first order will be exactly what you wanted. After that, it's a crap shoot - never mind I'd never be able to get anything customized at the minimal order volumes I'm presently operating at." If a look at the above photo conjures up super tweeter lust, Nenad and Alex at Raal might have you covered. There exists a Spirit 1 dedicated super tweeter in a Nenad-crafted wood-finish pod with a Raal ribbon and Raal crossover matched to your mains. 6moons scribe Linnman commissioned a pair to use on his Swiss Da Vinci Audio Labs widebanders a while back. I'd be shocked if future inquiries for other pairs fell on deaf ears with our Serbian gents. Back to sonics. 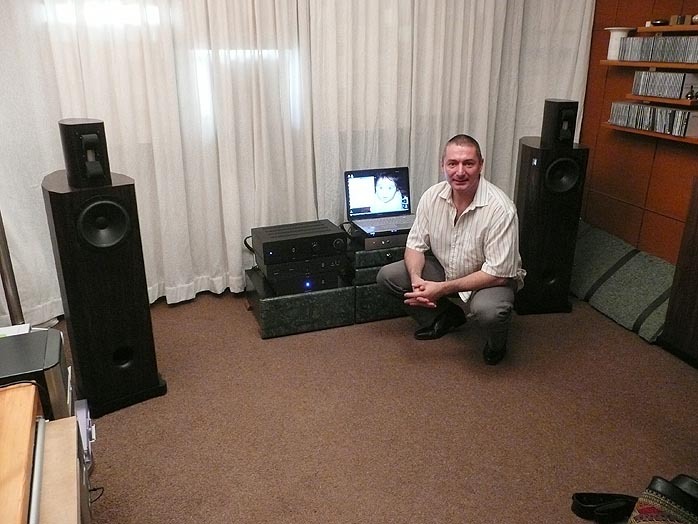 Based on a Raal-designed, Nenad-tweaked crossover, the time-aligned blend of mid/woofer and ribbon of the Xenia was seamless, betraying no textural or other discontinuities discerning ears love to pick out with most hybrid speakers where drivers based on different technologies are mated to each other. Put differently, single-driver speakers is where it would be at had we access to a driver that could, really and truly, cover the entire audible bandwidth in uncompromised fashion. Since such a driver doesn't seem to exist, a 2-way becomes the closest approximation. That's the field Nenad mines with his designs. He pursues single-driver coherence with expanded bandwidth and linearity. From what I heard in unfamiliar surroundings with unfamiliar electronics, I'd say he has succeeded. Here is Nenad's wife, a Finnish-trained physical therapist, 'the dragon' Solaja (otherwise known as Dragan) and Nenad, with Belgrade's artificial lake in the background. Nenad is a regular here since he designed and built the PA system of the beach-side live-music club. In fact, pro audio is what subsidizes as well as educates his consumer audio efforts. His dream is to transition fully into the latter. The Rocky Mountain Audio Fest 2008 will be the first time he attends an international audio show to cast his net. As he and Dragan kept reiterating, "we're fools for doing what we're doing. Serbia is simply the wrong place for it. But, this is our passion so we keep at it no matter what." While our ladies made off together, I turned our 3-boy lake party into an impromptu 'lecture' on what to expect from a tradeshow of RMAF's size. Working in Serbia's isolation, I felt they'd otherwise be ill-prepared for the sheer scale and variety of competition they'd encounter. Observing how the temperature of their anticipatory mood had dropped to sub zero by the time I was done, I kept reconfirming that they didn't have to worry about their sonic chops. That hurdle they had cleanly jumped. Now it was simply time to attend to the other half of the equation. The innate challenge of start-up audio companies is that the engineer-designers, among others, also must wear the hat of sales & marketing expert until they've grown enough to outsource those responsibilities. As we all know, very often it's not the sonically most deserving product that wins the race but the one with the most well-honed marketing muscle. Being well funded to bank-roll dealers and distributors is huge as well. Before we end on a depressing note though, let me reiterate that Ivette and I were really very impressed by Nenad's system. There's a wide variety of sonic flavors or religions. If your church is of the soulful transparency faith, the Xenias powered from the dragon's electronics have the unconditional blessing of your particular pope. And he would undoubtedly tell Nenad and Dragan to go out and spread that gospel. We wish them appreciative responses in Denver!